You can’t even handle how unbelievably, outrageously good these are. Not only are the pancakes a snap to make, but the topping is EVERYTHING. It’s packed with caramel, spices, apples, pecans, pepitas and cranberries for the ultimate fall treat! True Story- I made these and ate the whole batch. I know, I know- that’s kind of gross and definitely not normal, healthy behavior. I don’t know what to say- my only defense is that they were honest to God that good. 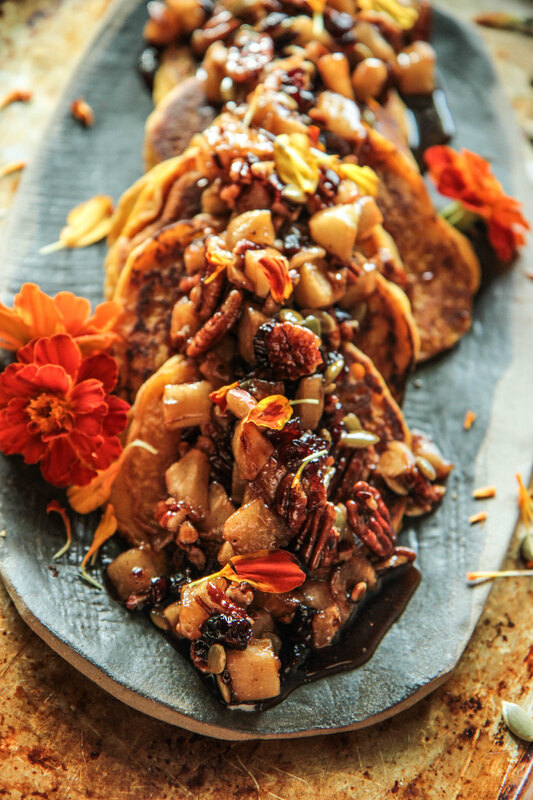 The pumpkin pancakes would have gotten be excited all on their own, but let’s be real- its really that crazy brown-sugary-maple caramelized apple, pecan, pepita, cranberry situation that really did me in. And I know I am not alone! Everyone in my family that had a chance to get into this dish when I wasn’t stealing the fork out of their hands was in agreement. Yum and yum- definitely make these this fall, you will not regret it for a single second! Quick note- if you have a nut allergy, these are obviously delicious without the pecans, and you still get lots of crunch from the pepitas- you could just add a few more of those. I also think that golden raisins or dried tart cherries would be a lovely addition or substitute for the cranberries. In a small bowl, combine the coconut milk and the apple cider vinegar and set aside. In a medium mixing bowl, combine the dry ingredients and then add the milk/vinegar combination and the pumpkin puree and whisk until smooth. Heat a heavy skillet over medium heat and spray it with coconut oil. Drop the batter in rounded spoonfuls and let cook for a minute or so until there are little bubbles around the edges and they flip easily. Cook another minute until cooked through. Continue until the batter is gone. Keep pancakes warm in the oven on low until they are all cooked. In a heavy skillet or pan over medium heat add the coconut oil and the apple and cinnamon and saute for 2-3 minutes until the apple is starting to get soft. Add the pecans, cranberries and pepitas and stir to coat with the coconut oil and apple mixture. Reduce the heat to low and add the brown sugar and the maple syrup and let the whole mixture simmer for a few minutes until the brown sugar has dissolved and you have a caramel/Syrup sauce. Spoon the caramelized topping over the pancakes and serve hot! 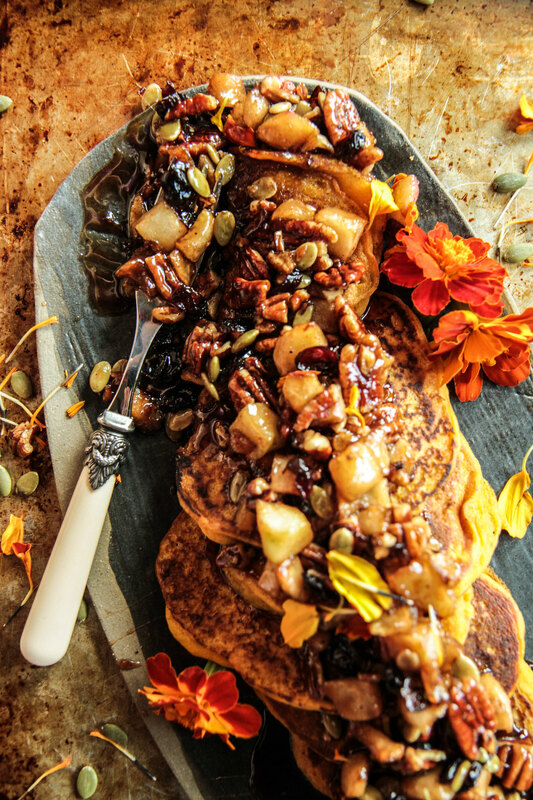 These just might be the most festive fall pancakes EVER! Is that 1/2 cup pumpkin puree? Yes! Thank you Nechama- typo fixed! This looks amazing! Is it 1/2 cup pumpkin purée? Can’t wait to make it, thank you! Yes! Sorry Peg! typo fixed! The amount of pumpkin puree is unclear and is not included in the instructions. Could you please clarify? They look amazing and I would like to whip up a batch.